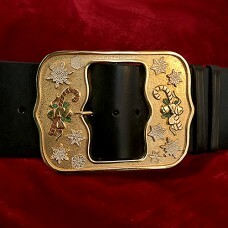 Now available on ToysForSanta.com, a special, hand-painted edition of Eileen Strom's beautiful Candy Canes and Snowflakes Santa belt buckle. This custom designed and fabricated all-metal solid cast belt buckle is made from strong, 5mm thick zinc alloy and then heavily plated in precious 18k Gold for an easy-care, non-tarnish finish. On this special edition design, the featured snowflakes and candy canes have a color-coordinated color enamel applied to highlight the details: Snowflakes are white, holly leaves green and the candy cane with red stripes. At 5.5"H x 7"W and using a traditional tongue and tang design, this buckle will accommodate a full-width four inch (4") leather belt and the gentle curve of the buckle helps keep it flat across the cookie zone. This special edition design is a ToysForSanta.com exclusive. 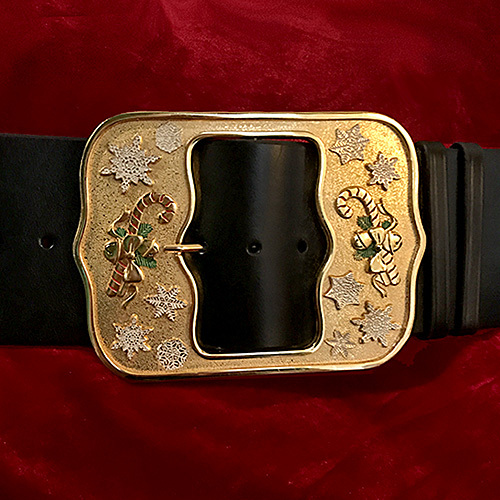 Additionally, we carry this buckle in a broad selection of colors and plating options, including red or green transparent enamel over 18k gold plate, red or green transparent enamel over rhodium (bright silver color) plate, black translucent enamel over both gold and rhodium plate, 18k gold or rhodium plate with inked details, and shiny 18k gold plating with no inking. At these prices, you will want several.